Emma Peterson majors in international studies and Spanish, with a minor in French, earned a certificate in Teaching English to Speakers of Other Languages and last year started learning Mandarin Chinese. 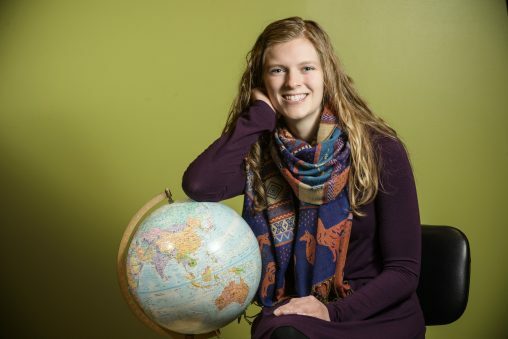 When she begins her Fulbright experience in Taiwan this summer, it will be the fifth foreign country Emma Peterson has lived and studied in during the past four years. The Wright State University international studies and Spanish major has also studied abroad in Costa Rica, Chile, France and China. Her upcoming overseas adventure is an 11-month program beginning in August that will put her in elementary or middle school classrooms in Taiwan as an English teaching assistant. It is courtesy of the prestigious, highly selective Fulbright U.S. Student Program, which counts ambassadors, congressmen and women, judges, heads of corporations, university presidents and other professionals as alumni. The Fulbright U.S. Student Program is the largest U.S. exchange program offering opportunities for students and young professionals to undertake international graduate study, advanced research, university teaching and primary and secondary school teaching worldwide. It operates in more than 140 countries. Students are selected based on their academic record, language preparation and the quality of their proposed community engagement project in their host country. Fulbright scholars meet, work, live with and learn from the people of the host country, sharing daily experiences. Through engagement in the community, the students interact with their hosts on a one-to-one basis to promote mutual understanding. “I believe that international understanding can be accomplished through interactions between people to people, bringing local to the global and global to the local,” said Peterson. Peterson grew up in Maine before moving to Ohio for the final two years of high school. Her parents both worked in academia — her father an English professor and her mother a professor of anthropology and archaeology. Peterson said she got to know foreign exchange students at her high school in Maine from China, Japan, Finland, Spain, Italy and Thailand. “Being able to meet people from different countries and sharing culture was what inspired me to pursue anything in the international field,” she said. 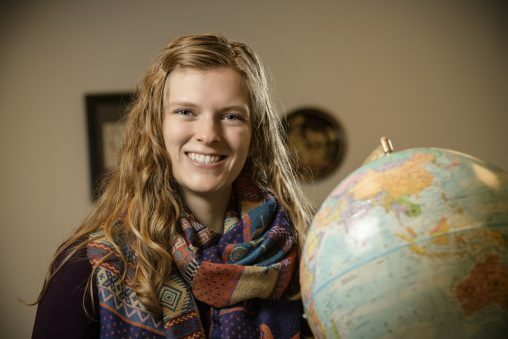 After graduating from Centerville High School in 2015, Peterson enrolled at Wright State because of its opportunities in languages, international studies, study abroad programs and because of the University Center for International Education, which coordinates exchange and study abroad opportunities and helps internationalize curriculum. Peterson, who carries a 4.0 grade point average, double majors in international studies and Spanish, with a minor in French. She earned a certificate in Teaching English to Speakers of Other Languages from the Department of English Language and Literatures and last year started learning Mandarin Chinese. Peterson practices her languages by watching foreign films or reading books in foreign languages. Her most recent reading-for-fun book is Barbara Kingsolver’s “Prodigal Summer,” an ecological-themed novel that tells three stories of love, loss and connections in rural Virginia. During her study abroad stint in China, Peterson was based at a university in Chengdu. The city of 10 million is one of the most important economic, financial, commercial, cultural, transportation and communication centers in western China. It is also home to the famous Chengdu Research Base of Giant Panda Breeding, a conservation center where visitors can view endangered giant pandas in a natural habitat. She said the Chinese people were very welcoming and even helped her work on her Mandarin Chinese. While she was there, she and another American student facilitated a cultural exchange with Chinese middle school students and learned a bit about each other’s cultures. Peterson hopes to have a library-related, community engagement project in Taiwan. “I would really like to work with the local libraries and maybe do English reading, picture book lessons and get parents and the community involved,” she said. Emma Peterson has her sights set on graduate school and wants to study something in the international sector. A career in higher education or an international non-profit or nongovernmental organization is on her radar. Peterson has volunteered in Wright State’s Learning English for Academic and Professional Purposes (LEAP) Intensive English Program, serving as an intern, tutor, in-class helper and a conversation partner with international students. She also completed her semester-long TESOL internship in LEAP, which provides English instruction and helps non-native speakers develop the linguistic, academic and social skills they need to be successful in college and beyond. Peterson has also volunteered and worked for UCIE, interacting with international students in conversation and global-connections events, serving as a study-abroad mentor and working in international admissions. In addition, Peterson worked as a president’s ambassador, part of a premier group of students who serve as official representatives of Wright State and the Office of the President at presidential dinners, meetings and other events. They also give guided tours and meet with community leaders, alumni, donors and dignitaries. Peterson is also co-president of the Dean’s Student Advisory Board in the College of Liberal Arts. The board advocates for liberal arts students and acts as a liaison between the students and the dean. Peterson said Wright State has definitely enabled her to be successful. Peterson has her sights set on graduate school and wants to study something in the international sector. A career in higher education or an international nonprofit or nongovernmental organization is on her radar.